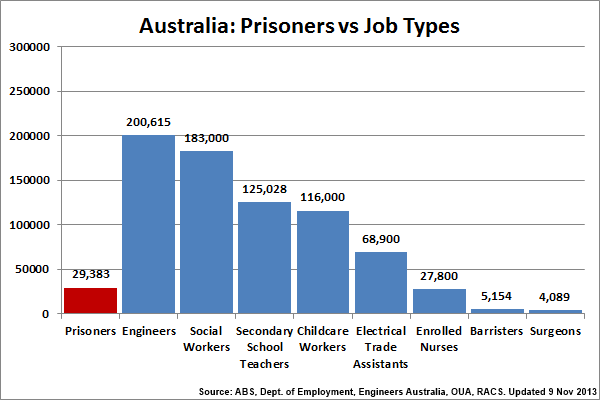 Saki Knafo of the Huffington Post posted an interesting article and infographic about the massive size of the US prison population against employee’s, such as specific engineering and education job types as defined by the Bureau of Labor Statistics. Excerpt: If sitting in a prison cell was a job, it would be one of the most common jobs in the United States. In 2012, there were some 1,570,000 inmates in state and federal prisons in the U.S., according to data from the Justice Department. By contrast, there were about 1,530,000 engineers in America last year, 815,000 construction workers, and 1 million high school teachers, according to the Bureau of Labor Statistics. For the full article and Saki’s observations click here. I thought it would be interesting to do a comparison infographic using Australian data. The key finding of my comparison infographic is that this highlights the extraordinarily high incarceration rate for the United States where around 716 per 100,000 people are in prison. In Australia the figure is 130. For context some believe that North Korea has an incarceration rate of between 600-800! So, then when you compare it against job types the differences really stand out. Australia has 200,615 working engineers (there are actually 245,631 qualified engineers) and according to the most recent census 125,028 school teachers. My secondary school teacher data is based on a tweet by the ABS which is 1,000-higher than the current public estimation from the 2006 census. Although I was happy with most of my data comparisons not everything quite translates from the United States to Australia. Detailed numbers by the Australian and New Zealand Standard Classification of Occupations (ANZSCO) is difficult to come by whereas the Occupational Employment Statistics detail provided by the Bureau of Labor Statistics was very detailed. 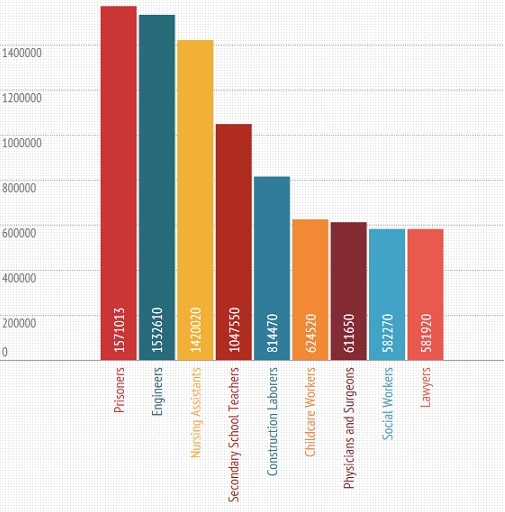 Thus engineers, social workers, secondary school teachers, childcare workers and enrolled nurses (the US equivalent being nursing assistants) are very like-for-like occupation types. US physicians & surgeons vs. Australian surgeons. Again, I believe the numbers to be comparable but with the caveat that I took my numbers from the Royal College of Australian Surgeons only.